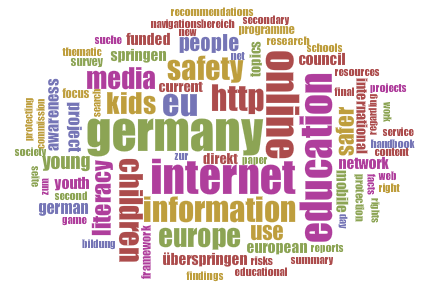 Tag cloud using words from this dossier on Media Literacy and Internet Safety. These resources highlight safety aspects of Internet use from an international perspective. The EU Kids Online project was launched in 2006, and funded within the EU Safer Internet Programme initiative, in order to create a network of experts on the use of online media by children, and to procure evidence on the media-related conduct of children and youth in Europe, and deliver recommendations for the empowerment of young people regarding a safer use of new media and raising awareness of risks. The project was funded by the European Union to investigate children and their behaviour on the internet, particularly using mobile devices (smartphone, tablet). A final report was issued in 2014, which is available for download together with other material and reports. European network of Awareness Centres promoting safe, responsible use of the Internet and mobile devices to young people. Co-funded by the Safer Internet Programme. Within the framework of its Information Society activities, the EU Commission organises a Safer Internet Day in February. This report focuses on a comparison of findings from two EU-funded projects, EU Kids Online (2010) and Net Kids Go Mobile (2014), the latter of which concentrated on children\'s use of the internet via tablets and smartphones. Report prepared for the Council of Europes Group of Specialists on Human Rights in the Information Society by Andrea Millwood Hargrave. Bearing in mind the usefulness of new media and the right to free media use and access, the report outlines potentially harmful content and recommendations for protecting children and young people (minors). The Youth Protection Roundtable was a project funded in the framework of the Safer Internet Action Plan of the European Commission from November 2006 till April 2009.